'Boyd is back on a form few of his contemporaries can match. 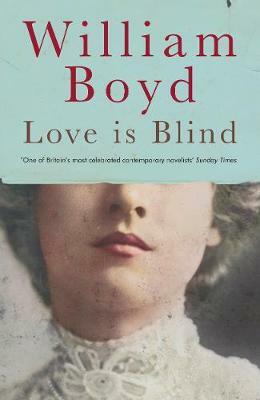 This fine, touching and clever book is the best thing he's written since [Any Human Heart] and deserves similar adulation' Guardian Love is Blind is William Boyd's sweeping, heart-stopping new novel. Set at the end of the 19th century, it follows the fortunes of Brodie Moncur, a young Scottish musician, about to embark on the story of his life. When Brodie is offered a job in Paris, he seizes the chance to flee Edinburgh and his tyrannical clergyman father, and begin a wildly different new chapter in his life. In Paris, a fateful encounter with a famous pianist irrevocably changes his future - and sparks an obsessive love affair with a beautiful Russian soprano, Lika Blum. Moving from Paris to St Petersburg to Edinburgh and back again, Brodie's love for Lika and its dangerous consequences pursue him around Europe and beyond, during an era of overwhelming change as the nineteenth century becomes the twentieth. Love is Blind is a tale of dizzying passion and brutal revenge; of artistic endeavour and the illusions it creates; of all the possibilities that life can offer, and how cruelly they can be snatched away. At once an intimate portrait of one man's life and an expansive exploration of the beginning of the twentieth century, Love is Blind is a masterly new novel from one of Britain's best loved storytellers.